Seamless steel pipes or tubes manufactured to ASME SA335 P92 or ASME SA213 T92 are widely used in supercritical and ultra-supercritical power plant units. Postweld heat treatment for this material is mandatory. The P92/ T92 steel (UNS K92460, 9Cr-2W) shall be considered P-No. 15E Group 1 according to ASME BPVC Code Case 2179-8. 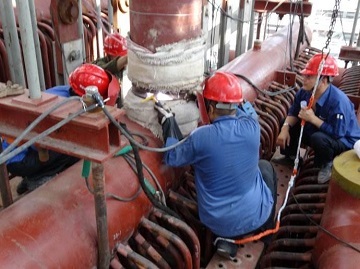 The welding of ASME SA335 P92 seamless pipes for a ultra-supercritical unit in Henan, China. The postweld heat treatment(PWHT) should be conducted in conformance with ASME BPVC Section I Table PW-39 or ASME BPVC SECTION VIII UCS-56-11. Generally, the minimum holding temperature is 1350°C[730°F]. When the nominal weld thickness is ≤ 5 inch[125 mm], the minimum holding time at normal temperature shall be calculated as per 1 hour per inch[2 minutes per mm] with a 30-minutes minimum limit. When the nominal weld thickness is over 5 inch[125 mm], the minimum holding time at normal temperature shall be 5 hours plus 15 min for each additional inch[25 mm] over 5 inch[125 mm]. If the nominal weld thickness is ≤ 0.5 inch[13 mm], the minimum holding temperature is 1325°F[720°C]. Moreover, for dissimilar metal welds (welds made between P92/ T92 and another alloy steel), if filler metal chromium content is less than 3.0% or if the filler metal is nickel based or austenitic, the minimum holding temperature shall be 1300°F[705°F]. If the actual chemical composition of the matching filler metal used when making the weld is unknown, the maximum holding temperature shall be 1425°F[775°C]. If the chemical composition of the filler metal is known, the maximum holding temperature can be increased as follows: (a) If Ni+Mn<1.50% but ≥1.0%, the maximum PWHT temperature is 1,450°F (790°C); (b) If Ni+Mn<1.0%, the maximum PWHT temperature is 1,470°F (800°C). Since the lower transformation temperature for matching filler metal is affected by alloy content, primarily the total of Ni+Mn, the maximum holding temperature has been set to avoid heat treatment in the intercritical zone. During PWHT process, if a portion of the P92/ T92 steel pipe is heated above the heat-treatment temperature allowed above, the base metal (pipes) must be entirely re-normalized and tempered. The weld metal shall be removed and replaced.